Serenity Cottage ligger i sjarmerende Lakeside, MI. Nylig oppdatert i beroligende aqua nyanser og beachy innredning, er det en perfekt flukt fra hver dag. Start dagen med en tur langs de rolige, skogkledde veiene i området. På ettermiddagen går du til den private foreningsstranden (ca. 7 minutters gange) for dagen. Ved retur, vask sanden og dagen bort i utendørs dusj og forberede seg til å slappe av på wrap rundt dekk, privat bakgård eller skjermet i veranda. Når solen går ned, slapp av ved brannen i bakgården. Serenity Cottage er det perfekte stedet å utforske Harbour Country, med vinprodusenter, antikvitetsbutikker, restauranter, bondemarkeder, bryggerier og to offentlige strender, alt innen 10 minutters kjøring. Cozy, charming and so very comfortable! 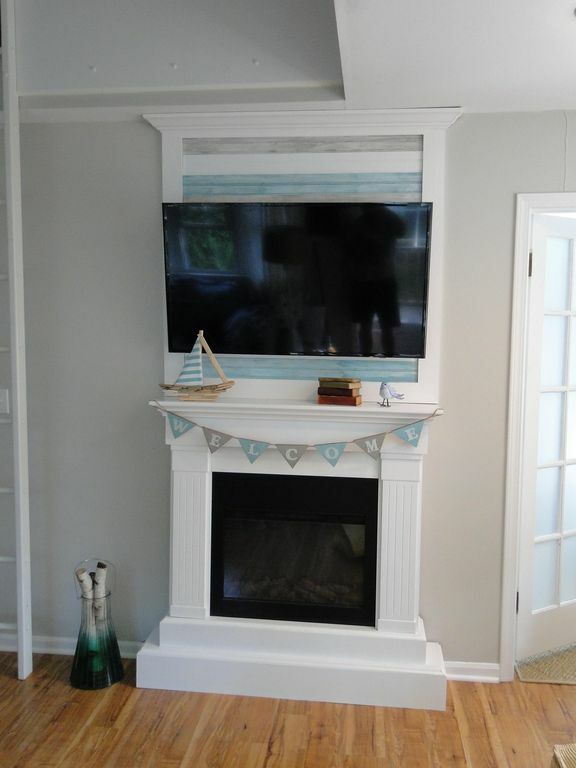 Such a well decorated and well appointed beach cottage! So clean with modern appliances, furnishings, etc. Very charming and hard to leave to explore the area given its cozy and inviting feel. A wonderful way to welcome in 2019! The cottage was as advertised. Brian and Lori were great communicators and willing to work with us on arrival and departure times (Thanksgiving Holiday) as well as any other concerns we had. The amenities were well thought out and in good working order. It was clean and everything needed was provided. This was our second stay in the cottage and will place it top on our list for future visits to the area. You won’t be sorry staying at this cottage. Adorable cottage worked perfectly for getaway with friends! Beautifully decorated, great space and wonderful location, close to a lot of area activities and restaurants. Perfect spot for longtime friends to meet up and enjoy each other’s company while exploring the area. Thank you for a great and memorable place! Super clean! Loved the beach decor! We had a great time with our family for a fall getaway weekend! The home was very clean-including the pillows and mattress pads! (noticed that when we stripped the sheets off the beds at the end of the weekend) Very impressed! Everything was nicely re-done and we loved the beach decor. The kitchen was very nice. We appreciated having a washer and dryer accessible. We loved seeing a little bit of wildlife while we were there--a mother deer and fawn hung around for a day or two. We played games and watched a couple movies while we were there. And the beach was a five minute easy walk away. We also went horseback riding and wine tasting. Restaurants we enjoyed in the area: Stray Dog and Redamak. Warren Dunes and New Buffalo Beach were also not far away. Would definitely consider staying here again. Brian was very helpful! If I had one suggestion for future improvement, I would suggest they some day make the large screened in porch an all weather room for year round use. just to give a little extra room during the colder months. Everything was picture perfect. The location is great and we loved the access to the private beach. We hope to come back again soon! Three friends enjoyed this darling cottage for a girls weekend. Looks just like the pictures and is very clean and comfortable. The only reason I didn’t give it five stars is because even though we were told by the owner to contact him if we had any questions, we got no response to a phone call asking about where to find coffee filters...an item we expected to find in this otherwise well-stacked cottage. The entire weekend went by with no contact from the owner. We bought our own coffee filters the next day, but if there had not been a Keurig and a few pods in addition to the regular coffee maker, we wouldn’t have been able to make coffee our first morning there. All things considered, coffee filters are not that big of a deal, but the lack of response was very disappointing.